The 3D Silver & Cream Flowers come in a pack of ten and cost £2.79. Apply to your nail with nail glue. "Creative Ten was born in 2002 out of my passion for nail art - and for nail art products that just couldn't be found in the UK at that time - good quality products that kept their colour, their shine and really lasted. Nowadays Creative Ten not only imports great nail art products, we help develop innovative new lines too. Our philosophy is consistent - it’s all in the quality, but that doesn’t mean the you are stung on the price! I hope you enjoy using the products we supply. I have thoroughly tried and tested every item we stock before adding it to our range, so you can order with confidence"
You can catch up with Creative Ten on their website, Facebook & Twitter. This product was sent to my for my honesty review. 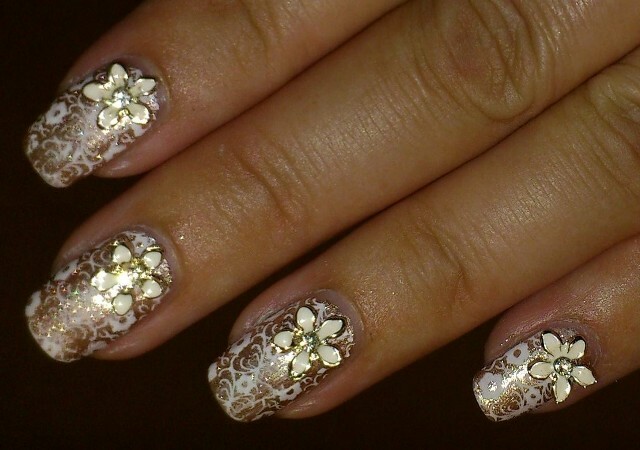 Good quality nail gems which will enhance your mani with a fantastic 'wow' factor! Highly recommended! Born Pretty Store $20 voucher GIVEAWAY!!!!!!!!!! Glitter Babies Working 4 the Weekend!